Frank Hampson was only thirteen when he got an assignment to draw sketches for Meccano Magazine. At the age of twenty, he started studying at the Victoria College of Arts & Sciences. During World War II, he served in the Royal Army Service Corps and became a lieutenant. At the end of the war, freshly married, he started attending the Southport School of Arts and Crafts and tried to make a living doing freelance jobs. He met Marcus Morris, a vicar, who had ambitions for founding a national Christian magazine, The Anvil, with a special emphasis on material for youngsters. Eventually, Morris employed Hampson full-time, and they created Eagle, the magazine that featured the popular ‘Dan Dare’ comics, 1950. 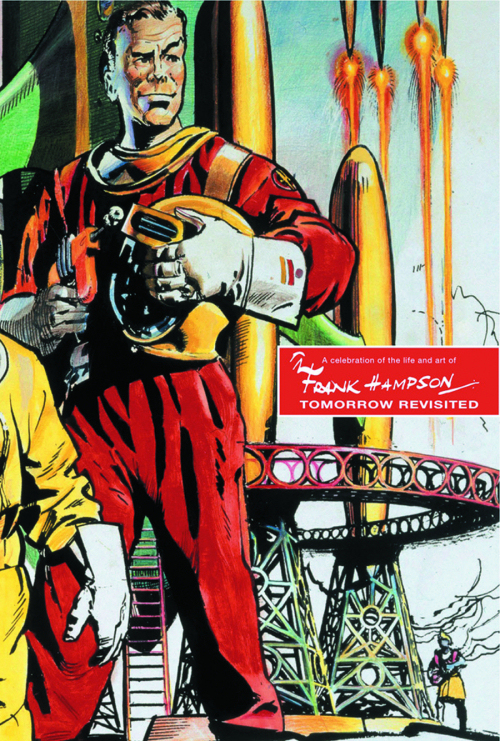 Hampson started out doing all the work single-handedly, but soon gathered a large crew of hard-working artists around him, including artists Desmond Walduck, Harold Johns, and Donald Harley, as well as writers Alan Stranks and Arthur C. Clarke. The years between 1955 and 1959 were the heyday of the Eagle studios. In addition to ‘Dan Dare’, Hampson has worked on a variety of other strips for Eagle, such as ‘The Great Adventurer’, ‘Tommy Walls’, ‘Rob Conway’ and ‘The Road of courage’. After this, with a new editor, Frank retired from the ‘Dan Dare’ strip, leaving it to Frank Bellamy. In 1975, he was given an award recognizing his work at the Comic Festival in Lucca. He died of a stroke in 1985. I think for people of my generation, Frank Hampson’s artwork on Dan Dare in the Eagle was admired and unequalled, at least till the Trigan Empire came along. I was fortunate enough to buy the Hawk books, which reprinted the Dan Dare pages, full size and in full colour on quality paper, as they are meant to be seen.